The hot tub pump is necessary component on all hot tubs and spas. The pumps primary function is to circulate the water in the hot tub. There are normally two stages of water flow. One is called the circulation cycle where by the pump generally spins at a lower RPM (around 1,750). This stage allows water to move though the filter system thereby cleaning the water with each cycle. This lower speed circulation cycle is also for heating the water. Water will pass though over the heating element and depending on its setting will increased in temperature through the heating element. A second speed is used for jet action (approx 3450 RPM). This speed will depend on the HP rating of the pump and the number of jets hooked up to the pump. The jet action can be done either by a separate hot tub pump or a pump that has two speeds. If an independent pump is used the system will have a circulation pump and a jet pumps. Most tubs use 2 speed pumps where by low speed is the circulation and high speed is the jet action. For very large tubs with many jets, 2 or more jet pumps may be used to power the jets. Pumps are rated according to HP however the actual performance of a pump will vary according to various factors such as the amount of jets and their flow rate (Gallons per Minutes) as well the amount of head pressure. A pump that is placed lower than the bottom of a tub will have to work harder than one that is placed at ground level. This is because the head pressure is greater. Most pump manufacturers will have stated pump curves. It is important that you select a pump based on these curves. Adding a larger pump may not always be the solution to more jet pressure. See a sample of flow curve. A hot tub pump consists of two major components. 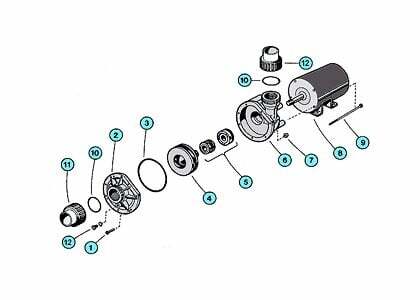 The 1st component is the pump motor. This is the large cylinder that is contains the electronics. The power cable is attached directly to the pump motor. To determine the size of ports your tub has you should measure the opening. Generally there are two main port sizes 1 ½” and 2”. These can be measured by the using a tape measure as in the diagram (not may not be exact). Leaking Pump Seal- The pump seal is water lubricated bearing that separates the wet end from the pump shaft. A leaking pump seal is perhaps the most common failure of a spa pump. A leaking pump seal needs to be fixed immediately as it will lead to further component failure if the leaking water gets in to the pump motor or spa controller. To replace the seal you must 1st remove the pump head. You will need to unscrew the bolts at the back of the pump motor. These are long bolts that go through the length of the pump motor and screw into the pump wet end. Once the pump head is removed, new seals can be installed. It is important to note that leaking seals are the 1st sign of pump deterioration. You may find that the time and money to repair a seal are signs of further problems. You may want to consider a new pump entirely rather than sinking money into an older pump. NOTE: Before any wiring is attempted you should ensure the main breaker is shut off. If you are not familiar with electrical wiring you should consult a professional! Hot Tub pumps comes two power sources 110-120 VAC or 220-240 VAC energy consumption. Depending on whether the pump is a one speed or two speeds will determine how many wires there are. Most two speed pumps will have 4 wire: red, black, white and green. The red is normally the low speed and black is high speed; white is common and green is ground. Your pump should have a diagram for you to follow. If the pump runs on high speed when it should be on low then chances are you have the pump wires (black and red) reversed. 95% of the time this is caused by a leaking water seal at the pump shaft. However you can also check the pump housing itself for leaks. Don’t overlook the obvious of a loose pump union or broken union seal. My pump hums but won’t turn? This can be many things however the two most common problems are a block or clogged impeller. Using a screw driver see if the impeller will turn? Anther common failure is the starting capacitor build into the pump motor has failed. Look for the obvious such a closed gate of ball valve. My pump comes on high speed not low speed? My pump makes a lot of noise? My pump gets very hot? A pump motor will generate lots of heat. This is normal. However just like a car, a pump can overheat if it is not operating properly. Blockages or clogged filters will make the pump work harder that it needs to. Clean filter often!